I’m always on the look-out for new (to me) fun inks to try. I recently discovered Ink by the ML and maybe went a little crazy with samples. L’Artisan Pastellier Classique Bouton D’or is a terrific yellow/orange. I would say that this swab scanned a bit darker than the color is in real life. Some people may find this one a bit too light to have a practical application – I, however, adore it and will be hunting down a full-sized bottle. So, since we’re on the topic, which off-the-beaten-path inks do you adore? 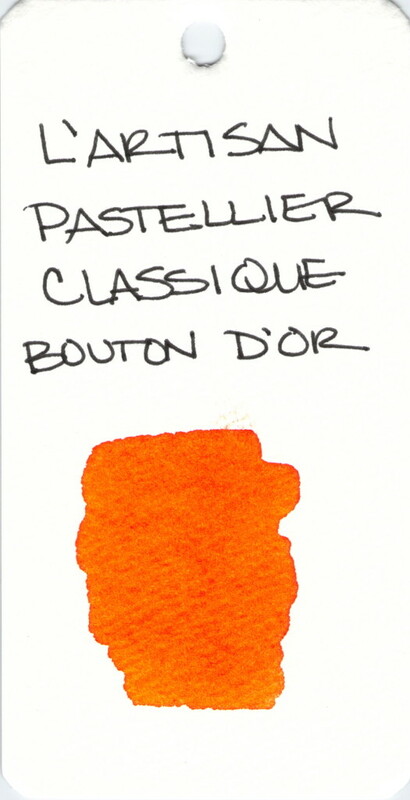 This entry was posted in INKS, LOVE and tagged ink swab, l'artisan pastellier, orange by Christine (Pentulant). Bookmark the permalink.